Visit the famed gardens of Villa Adriana, as well as Villa d’Este, on this private tour from Rome to Tivoli, where the historical sites are located. Travel with a private driver to reach the villas, where you’ll be wowed by the detailed landscaping, fountains and architecture. You’ll also have time in the town of Tivoli to buy lunch. Next, you have free time in the town of Tivoli. Visit a restaurant where you can have lunch (own expense), and enjoy time to walk around town and take in views of the Roman countryside. 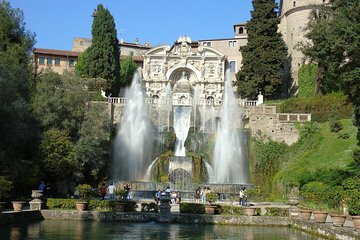 Then head to Villa d’Este, built during the Renaissance years around 1550 for Cardinal Ippolito II d’Este, the governor of Tivoli. Explore the gardens with your guide to see its Bernini-designed fountains and take in the lavish landscaping. This icon of Italian-style garden has been imitated around the world, so much so that musical composer Franz Liszt wrote a piano suite entitled ‘Fountains of the Villa d’Este. Your tour ends with return to Rome for hotel drop-off. Bit of a confusion re the booking - were advised that though I had thought I had booked a guide, this was amended but the price was the same. Still went ahead though I thought a little pricey - made up for by the excellence of our driver and the flexibility on timing great, as one of our party was sick. Be aware that the recommended restaurant for lunch Ristorante Sibilla, which should not be missed is a walk through Tivoli town. Definitely worth it. This worked out very well, driver was on time, and took us to the sights and we had plenty of time to see the sights. I would recommend this as a good day outside of Rome. Well worth the visit and a pleasant respite from the heat and crowds of Rome. We found the audio guide to be worthwhile.